As my skin's the clearest its been for a while, I thought I'd share what's helping me banish my blemishes. Having fought them off from the age of 13, I'd like to think I know what does and doesn't work for my skin by now. 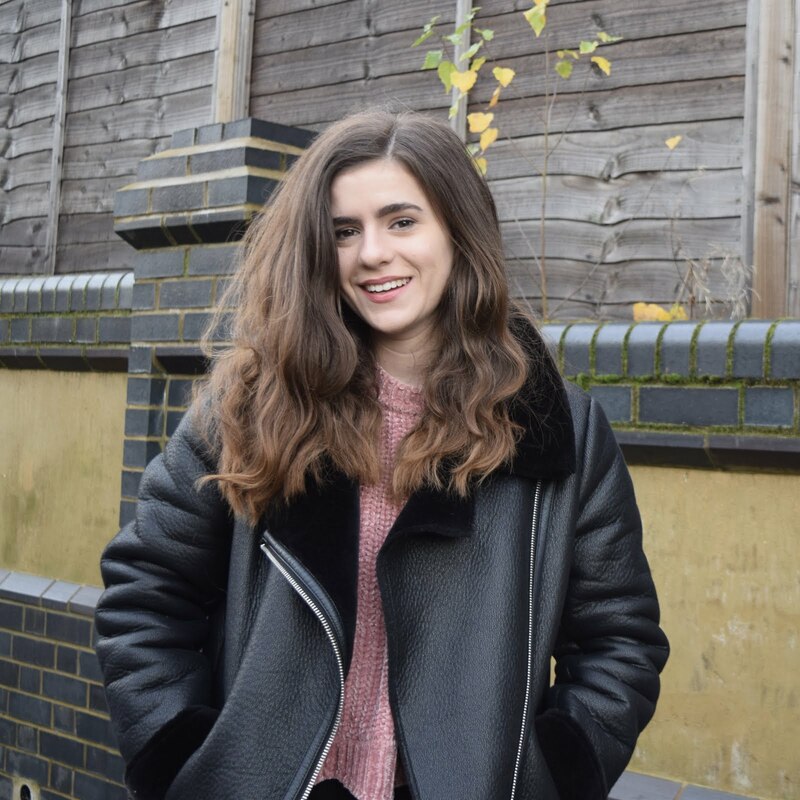 The tricky thing to blogging about skincare is that everyone's 'skin type' is unique, so FYI this is written from the perspective of a gal with blemish-prone, oily skin, who occasionally suffers from the odd dry patch around the eyes and upper lip area. This dryness normally rears its head in winter or when I've been using too harsh of a product - so look out for how I deal with that below. 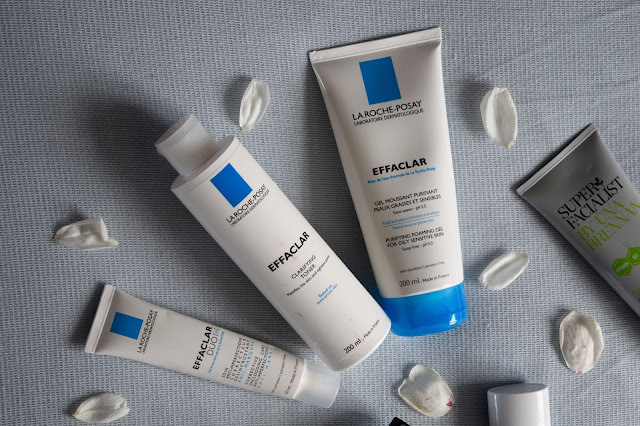 The Three Step Set: I was given La Roche-Posay's Effaclar '3-Step' Anti Blemish System for Christmas and I wanted to make sure that I gave it a proper trail before featuring it on here. This worked a treat in clearing up my skin, unclogging my pores and fading scars, but as I started using this new regime in winter, the chemicals within it proved too harsh to use it twice-daily. To give my skin a rest I started using the Clarifying Toner a lot less and have since repurchased the cleanser and cream seperately. The formula of the Purifying Foaming Gel leaves the skin feeling squeaky clean without stripping it of all its moisture. The cream (which I also wrote about here) is a holy grail product in my eyes as its the only effective treatment I've tried that reduces and fades scarring from previous spots as well as preventing and reducing the size and redness of existing blemishes. Overall the set is worth a whirl if your looking for an effective skincare regime, but I don't think I'll be repurchasing this set as a whole due to the toner's formula being a bit too harsh for my sometimes sensitive skin. 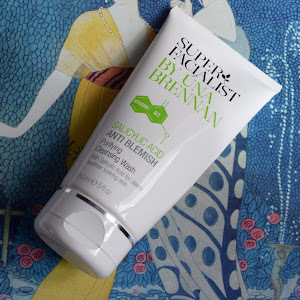 The Mask: I raved about the Super Facialist by Una Brennan's Salicylic Acid Anti Blemish Clay Mask not too long ago in this post, so I'll try not to babble on about this. When I first started using face masks, I was told that after using one, your impurities would be brought out of the skin and that my skin would get worse before getting better. 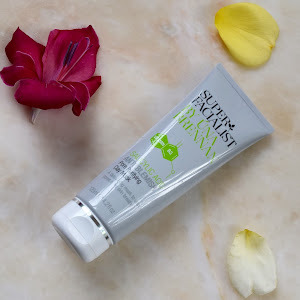 This rule is completely defied by this miracle mask, as overnight I have found my blemishes have been dramatically reduced or disappear altogether. The formula, unlike most anti-blemish masks, is actually moisturising and rebalances the skin to reveal a clearer, refreshed looking complexion. 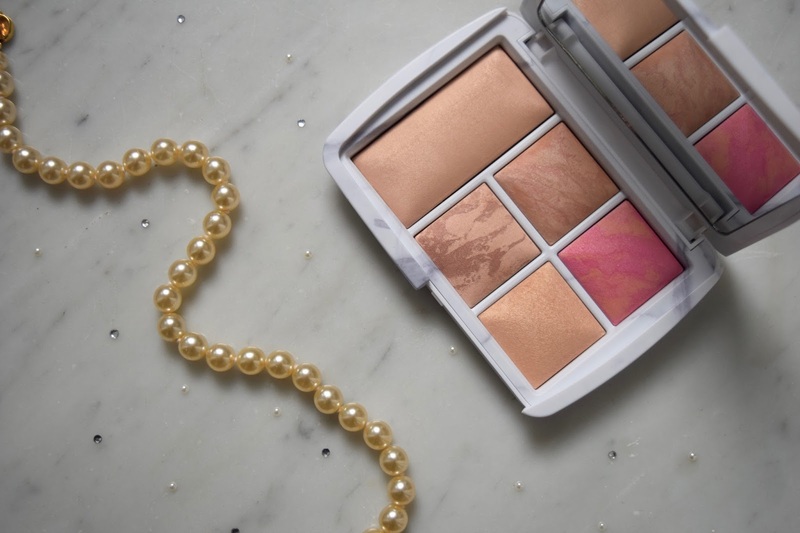 I have also found this to be one of the most luxurious feeling formulas on the beauty high street. The Gentle Toner: I actually wrote a full review of Lush's Tea Tree Water around this time last year and I have repurchased this a fair few times. Tea tree as an ingredient is antibacterial, antimicrobial and antiseptic, meaning that it keeps spot-causing bacteria at bay and the formula's combination is anti-inflammatory, and therefore helps to reduce the appearance of redness on the skin. This toner is so gentle on the skin and is still so effective in sweeping away excess oil and reducing the appearance of blemishes and red areas. Definitely one to try if you have sensitive skin. The Intense Treatment: For the stubborn spots that don't seem to budge when using the above, I find myself reaching for Clinique's Anti Blemish Solutions Clinical Clearing Gel as more of a targeted treatment. A little of this goes a long way and the formula is very drying and gel-like, so treats the spot without effecting the rest of the face. After application you can almost feel the stuff getting to work, and it definitely calms down any inflammation, or even pain, on the targeted blemish. This is also quite similar to Origins Super Spot Remover Blemish Treatment Gel. The Manual Scrub: When it comes to exfoliating the face, sometimes chemical exfoliators are not enough; enter Neutrogena's Visibly Clear Pink Grapefruit Daily Scrub. I love how small the micro-beads in this scrub are, and how they are effective in removing any flakes caused by spot-drying treatments without aggravating existing spots. The refreshing scent of grapefruit is so lovely and although this isn't the deepest of cleansers, it still works. In fact the whole grapefruit range is great, especially if you are on a tight budget - I love the Facial Wash and the Oil-Free Moisturiser. I hope you enjoyed this post and found it helpful if you are on the hunt for products that can give your blemishes the boot. 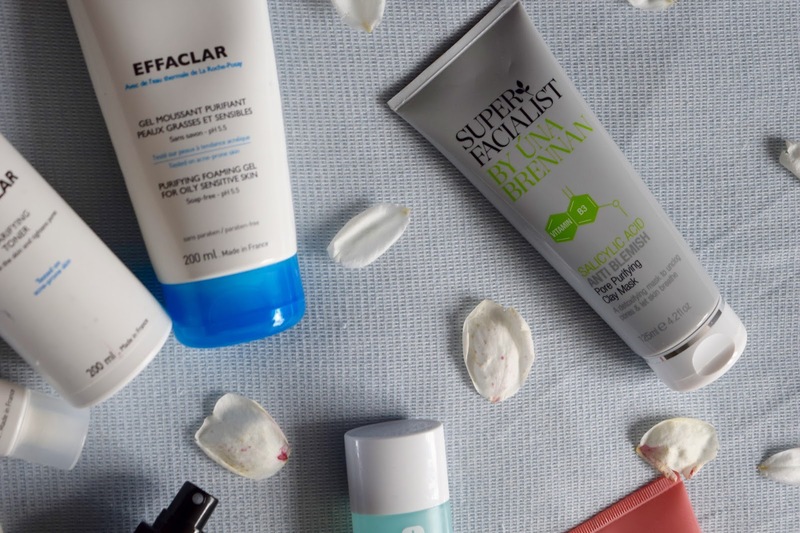 What are your favourite anti-blemish products? Any recommendations? Great products! 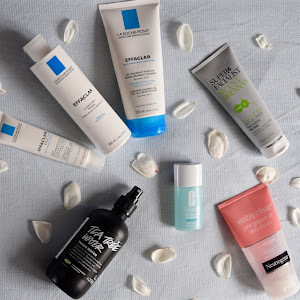 I am always dealing with acne so these are good recommendations. 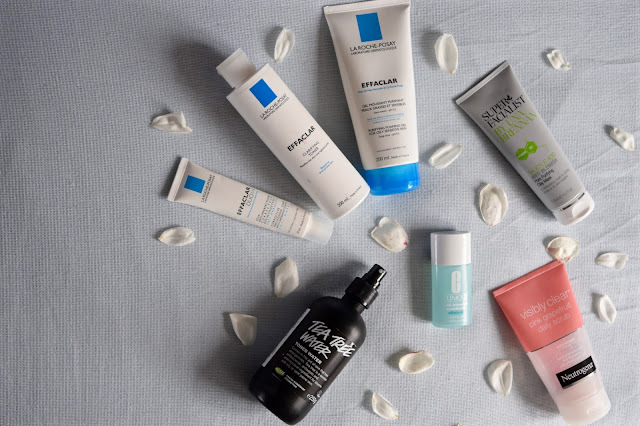 I've always been a big fan of La Roche products; they're just a bit pricey but worth it. 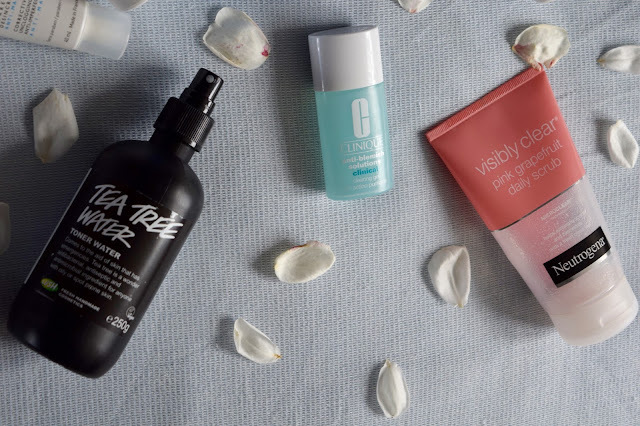 Checking out your blog after you left a lovely comment on my most recent post, and I just had to stop and say how similar our favourite skincare products are! I've used and loved ALL these products except the Clinique gel, which I didn't find particularly effective on my stubborn acne. I also couldn't get along with the Neutrogena scrub because of the scent - if they did it in another fragrance it'd be perfect! la roche posay seems so lovely. have to try some products of them soon. I really want to try the tea tree range from the Body Shop, I've heard so many reviews about it! I also want to try the Grapefruit scrub, bet it smells gorgeous!! I love the petals you put in the photos, it really adds a nice touch! It was helpful reading your reviews, I have this odd dark patch that showed up on my cheek a few months ago, and I've been too lazy to do anything about it, but these seem like great products! Ooh I love the Grapefruit scrub! 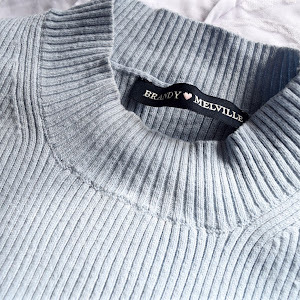 It's one of my all-time fave products. So gentle but effective, and it smells AMAZING. Love the grapefruit scrub - one of my absolute favs I always come back to! Come next pay day I'm planning on trying one of the La Roche products - probably the cream! What a nicely written post. I'll say my skin type is much like yours; oily, acne prone. I've been meaning to try the Lush Tea Tree toner for a while now because my skin gets sensitive, too, and oh, that mask sounds amazing!